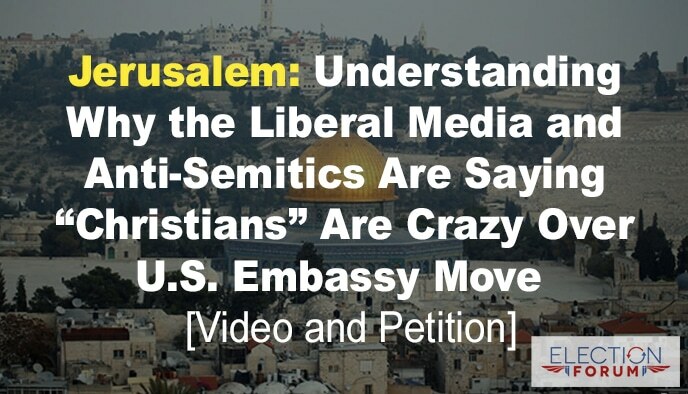 Christians are being called “crazy” for supporting moving the U.S. embassy in Israel from Tel Aviv to Jerusalem. For example, MSNBC commentator Chris Mathews lashed out at Christian evangelicals and their “crazy ideas about Israel which is (sic), I don’t know, mythical,” blaming them for President Trump’s decision to recognize Jerusalem as the capital of Israel. Other commentators mocked belief in the “rapture” and Christian interest in Israel and Bible prophecy. Jerusalem IS the capital of Israel and has been so since shortly after the formation of the nation in 1948. The Knesset, Israel’s parliament, has convened there since 1950. The Israeli president and prime minister have their official residences there. Jerusalem was the capital of ancient Israel, established by King David 1000 years before Jesus was born (2 Samuel 5:6-10), and over 1600 years before Muhammad. Pretending Jerusalem is not Israel’s capital to protect “the peace process” makes no sense because there is no peace process. Mahmoud Abbas, the Palestinian president, has refused to meet with the Israelis to discuss anything since 2010. President Trump’s announcement doesn’t change the status quo of East Jerusalem – the location of the Temple Mount – which will remain under Palestinian jurisdiction for now. Why is the 37-acre parcel of land in East Jerusalem known as the Temple Mount so important to Jews, Christians, and Muslims? It’s the highest point in all of Jerusalem. It’s the same place that was called Mount Moriah in the Old Testament – the location where God commanded Abraham to offer his son Isaac as a living sacrifice (Genesis 22:1-18). It’s the exact location where Solomon built the first Jewish temple (1 Kings 6-7). After the Romans destroyed the second temple in AD 70 (the first was destroyed by Nebuchadnezzar in 586 BC), the site remained barren for over 600 years. Muslims believe the Prophet Muhammad ascended to heaven from a rock in Jerusalem known as the Foundation Stone. In AD 691, they completed the Dome of the Rock over this location. Radical Muslim rage is eternal. No matter what anyone does to promote the security of Israel the Palestinians and other radical Muslims will protest.Whether using their own children as human shields or honoring cold-blooded terrorists, radical Muslims prefer death and destruction rather than peace. Favoring the Palestinians by not recognizing Jerusalem as the capital of Israel for the past 22 years hasn’t brought them any closer to a peace agreement with Israel. Muslim leaders actually dislike “Palestinians.” The worst kept secret in the world is that the Saudis can’t stand the Arabs who call themselves “Palestinians.”The Sunni Arab countries need Israel’s help against Iran more than they care for the theatrical Palestinians and their rich-living billionaire leaders. Israel is the “Strong Horse” in the Middle East. The Arab world has always lived by the tribal doctrine, Strong Horse, Weak Horse – a form of Darwin’s “survival of the fittest.”In a mere 70 years, the tiny nation of Israel has surpassed the strength of the entire 1400-year-old Islamic world. The Muslims fear and respect – and despise – Israel as the Strong Horse of the region. Ever since Israel recaptured East Jerusalem – also known as the Old City – during the 6-day war in 1967, many Bible scholars have focused on the prophecies regarding the city of Jerusalem. This past June marked the 50th anniversary of Israeli control of the entire city. Every 50 years in Jewish history marks an important milestone: a Year of Jubilee. When Jesus physically returns to earth in His Second Coming, he will set foot on the Mount of Olives just outside the wall of East Jerusalem; it will split in two from east to west, forming a valley which will provide an escape route for the besieged city. Then Jesus will defeat all the nations that have gathered against Jerusalem. Read the entire prophecy in Zechariah 14:1-15. During Jerusalem’s nearly 6000-year history, the city has been attacked 52 times, captured and recaptured 44 times, besieged 23 times and completely destroyed twice. Christians have been excited about Bible prophecy ever since Jerusalem was recaptured by Israel in the 6-day war of 1967 because that event could be an indication that “the times of the Gentiles” are nearing completion. The events immediately preceding the Second Coming of Jesus follow the fulfillment of the times of the Gentiles in Luke 21.